Drivers have been delayed for up to 12 hours on the way to the Port of Dover because of extra security checks. Drivers have faced two days of misery as they try to make their way to the Port of Dover and it’s expected to continue for the next two days. 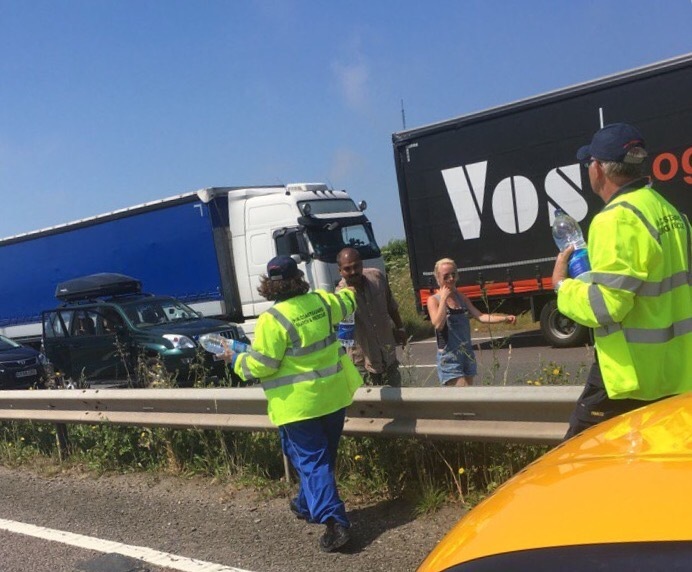 Facing delays of up to 12 hours on the A2 and A/M20, 11,000 bottles of water have been given out to those who were stranded. It could be a long night, as police think the chaos could last between 36 and 48 hours, so those just joining the end of the queue could have a night in their cars ahead of them. The disruption is due to extra security checks after the attacks in Nice last week at the request of French Authorities. Questions have been raised about the amount of staff in place to handle the increased checks, with some claiming there was only one member of staff on overnight on Friday. In the sun earlier many got out of their vehicles, but the police quickly asked people to remain at their cars as it was causing more delays as the traffic was stop start. Officers encouraged people to keep their cars ventilated too. The delays are going on in to the night and some have reported that it could take 30 hours from some areas to get to the port. Once you arrive at the port there is a further 2 hour wait. @IainPhilpott is furious as he has been in the traffic for hours after leaving his home at 4am on Saturday morning. He says the delays are much worse than the 12 hours most are expecting. Iain spoke to us from his car. We've also been told that Operation Stack will not be put in place as that is only for Freight. Police are advising local traffic going to Folkestone and Dover to use alternate roads – the more obscure the better. Delays are likely to continue through for the next 36 to 48 hours. 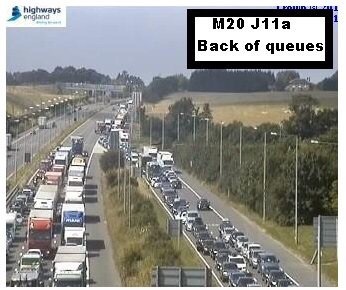 Anyone heading anywhere near the M20 at Folkestone coastbound or the A20 towards Dover WILL get stuck in traffic. There are currently waiting times of seven hours on the M20 and A20. Motorists are advised for their own safety to remain in their vehicles and not to walk on the motorway or hard shoulder. Traffic is queueing for approximate 12 miles. Operation Stack will not be used, it can only be used for freight traffic. The delays are a result of increased French border checks at the Port of Dover and Eurotunnel. They follow French government requirements to deliver heightened security checks to keep the traveling public safe following the recent attacks in France. Kent County Council is supplying 11,520 bottles of water for drivers currently stuck in the queues. This action is triggered when people have been stuck for over eight hours. The water will be distributed by Kent Police and the coastguard. More water had just arrived and a further 6,000 bottles are en route. Sections of the northbound A20 will be closed in order to distribute the water. The disruption has been caused by a vast volume of holiday traffic and delays caused by increased security at the French border. The French border control booths have been seriously understaffed overnight with only three booths available for tourists out of a potential seven. At one stage, only one French officer was available to check passengers on hundreds of coaches, resulting in each coach taking 40 minutes to process. The Port of Dover, which has no authority over French border operations, raised concerns over French manning levels with the UK Government earlier this week and the Government, in turn, raised the issue with its French counterparts. Motorists are advised to take plenty of food and water and to check with travel operators before making their trips. If possible, consider making alternative travel arrangements. Highways England, which manages the M20 and A20, provides live traffic information via its website, local and national radio travel bulletins, electronic road signs and mobile apps. Local Twitter services are also available at @HighwaysSEAST. Travel advice for drivers heading to the Port of Dover is also available on Twitter via @PoD_travelnews or from Kent County Council via @KentHighways. Alkham Valley Road will be closed end to end except for access for residents and emergency vehicles from 6:30am. This is to provide an unrestricted access route for emergency services and essential traffic management vehicles to provide welfare to traffic stuck on the A20. Unfortunately, as this is an emergency closure, residents have not been directly contacted. This will remain in place until welfare is no longer an issue. At present this is expected to be within 36 to 48 hours. Disruption on the roads leading to Dover is set to continue for the next 36 to 48 hours. Ferry crossings are continuing as usual as the Port of Dover, Highways England and Kent Police work together to minimise delays to motorists and clear the backlog of traffic. Motorists are currently experiencing delays of approximately seven hours. The delays are due to increased security by the French Authorities and a vast volume of holiday traffic. Traffic is queuing back from Dover for around 12 miles. Motorists are advised to take plenty of food and water and to check with travel operators before making their trips. If possible, consider making alternative routes or travel arrangements. Kent Police is urging motorists to remain with their vehicles - traffic is stop and start and exiting vehicles can be dangerous. Delays have also been caused by motorists not being with their vehicles when traffic starts moving. Kent Police has assisted Highways England by enforcing a partial lane closure of the London-bound A20 so that water can be given to motorists on the Dover-bound carriageway. Lane one remains open. 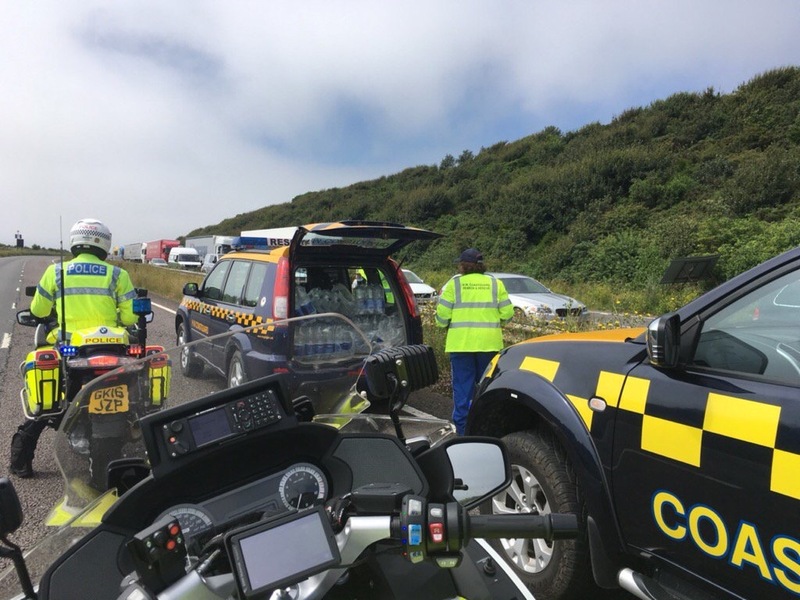 The water is being handed out on the motorway by officers from HM Coastguard and Kent Police. Its provision has been arranged by Kent County Council. Anyone who has an urgent medical issue should call 999 in the case of an emergency and 111 if the matter is not urgent. In order to stay safe drink regularly, wear sunscreen and keep vehicles well ventilated. For further information, please contact your travel operator, visithttp://www.highways.gov.uk/traffic-information or follow @HighwaysSEAST on Twitter. The Port of Dover is also providing travel updates via @POD_travelnews.